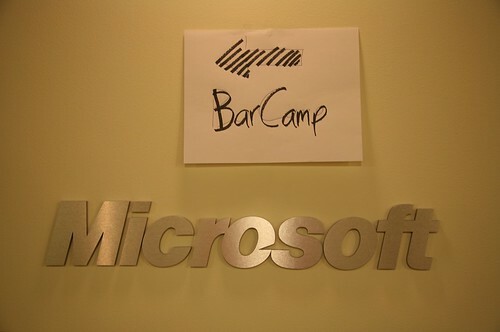 I really shouldn’t post anymore before at least mentioning that BarCamp San Francisco has come and gone, offering something between a roar and a whimper. The truth is, it was such a big, multi-tiered kind of experience that I think it’ll take me awhile to unravel it. Fortunately there’s lots of photos and even some interesting video available in the meanwhile. Thanks again to the folks who really made it possible: especially the lead organizer and my favorite co-camper, Tara, and Tantek, Nima and the host of awesome volunteers who pitched in throughout the event. And don’t forget our extremely supportive sponsors who fed us and gave us nice things to drink all weekend. The event simply wouldn’t have been possible — or nearly as satisfyingly exhausting — if it weren’t for all the additive efforts of these folks.